Samsung; South Korea’s largest multi-industry conglomerate. Bang & Olufsen; Denmark’s leading designer and manufacturer of high-end audio, telephone and television products. Each is respective giants in the world today. Destiny unites them and plans are made to surprise us all. Their first collective efforts unleashed the Serene, a mobile phone unlike any other that left the world on edge, not knowing what to expect. Now these technological powerhouses return and combine their arsenal, ready to let loose another wave of ingenuity. 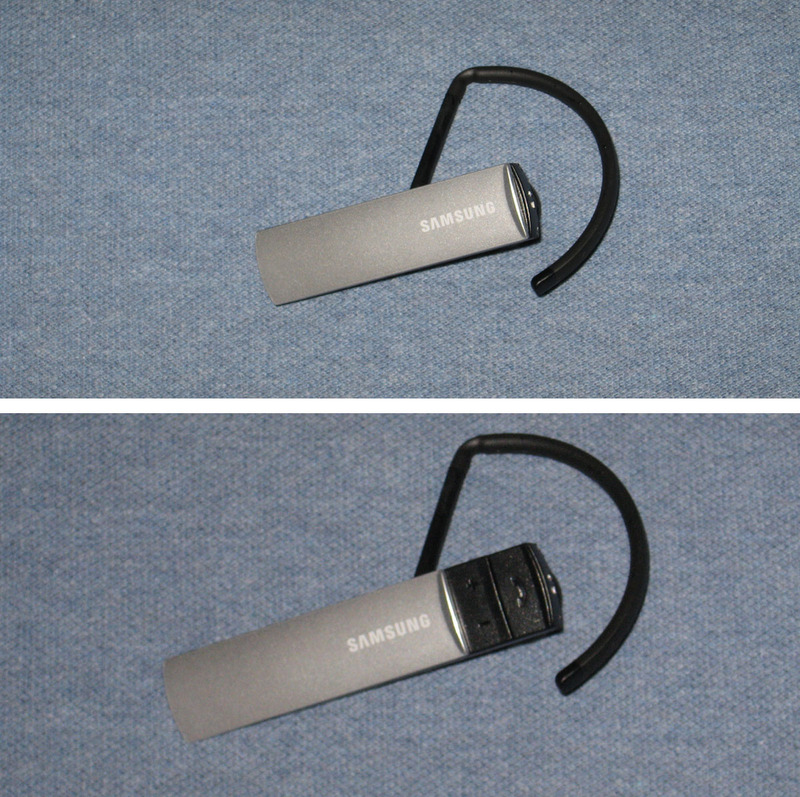 To bestow upon us a Bluetooth headset that offers effortless controls and an exquisite design. 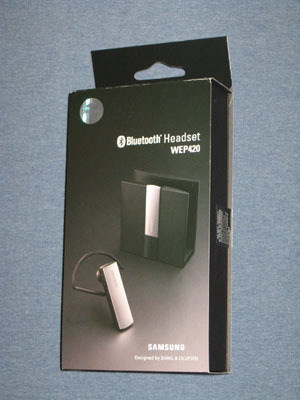 Make way for their latest spawn; Samsung’s WEP420 Bluetooth Headset!! 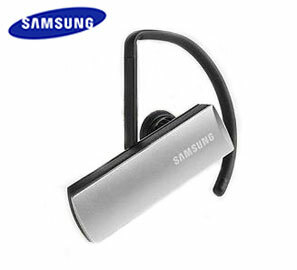 This headset comes bursting in at $89.95 at the always open, always friendly CrackBerry Store! When I gazed up the black box, I smirked at the look of it. It reminded me of 2001: A Space Odyssey, when the huge black rectangular monolith appears. Now, I wasn’t as nervous as the primates were when I examined it, but I was quite excited when I made my discovery. Now, I must firstly talk about the “Tower of Power” as I have dubbed it. The headset cradle is the most unique charging stands I have ever seen for a headset. This black monument may grab more attention than the headset it powers. 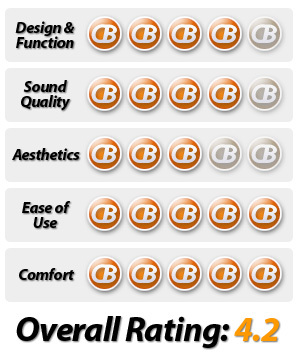 Hopefully, the designers focused more on the functionality of the headset than the design of the cradle. According to Samsung’s tele-reps, it’s supposed to blend into office or home décor, adding a dab of flair. It looked like a napkin holder rather than a conversation piece to me. 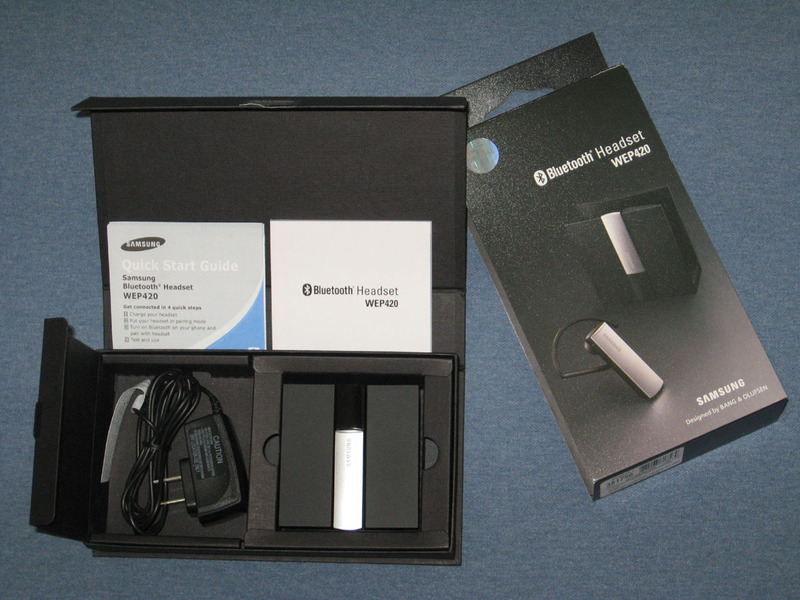 As I mentioned in my last Samsung review take care to not lose this important piece of the kit, the travel charger plugs into the cradle, not the headset. The headset is almost artwork in itself, combining smooth curves and sharp rectangular designs. The shapes are accentuated by a chic black and silver color (or shade) scheme. 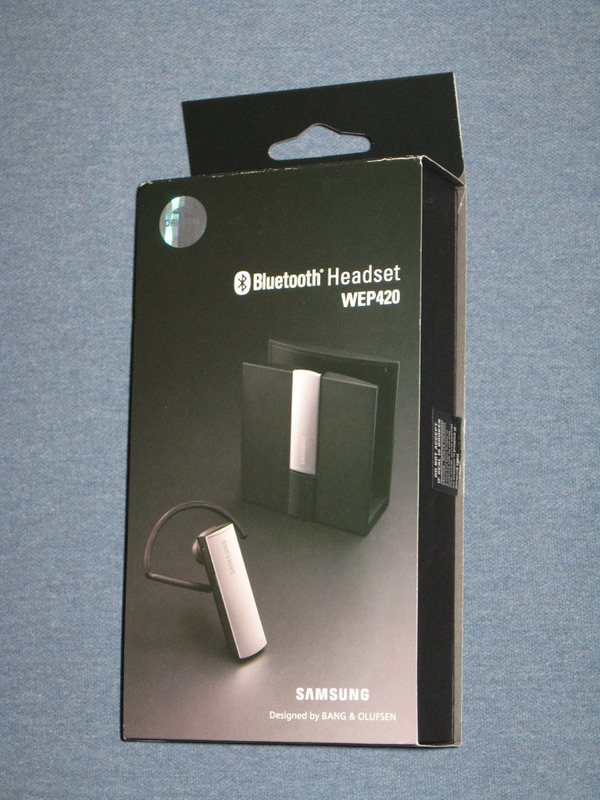 The WEP420 sports an ear-loop that swivels 180 degrees so you can wear it on either ear. 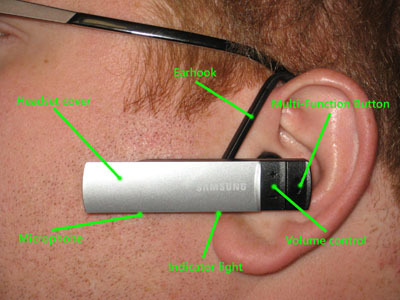 I am proud to say that the WEP 420 may favor the southpaws as the Samsung name is shown right side up when worn on the left ear. I’m surprised that this headset isn’t featured at the Leftorium. First RIM gives us a trackball instead of the track wheel, now this. We lefties are taking over! From the pictures, you can see the amount of space between the headset and ear-loop and the thinness of the ear loop. At first glance, one might think that the headset would be quite a loose fit. On the other hand, I don’t think I’ve ever had a headset fit so nicely. The fit is balanced out with the conical earpiece that fits further into the ear than most, but doesn’t cause discomfort. In my opinion, the only down fall to the design would be its storage capabilities. Some may find it a little bulky to fit into your pocket. The headset has a maximum talk time of 4 hours and a standby time of 70 hours. When charging, the indicator light remains red until it’s fully charged. Then light will then turn to blue. A full charge takes 2 hours. This does hold true, if the headset fit nicely into the cradle. I thought that it should have been simple enough,; plug in the cradle to the charger and place the headset in. On my first field test, the headset kicked out at only 20 minutes. I gave the headset my signature “ I beg your pardon?” look, “was that all I was going to get from you?” After fiddling with the connection for a few minutes once I got home, I successfully made a connection. Something so simple shouldn’t give this kind of difficulty. Bang & Olufsen has been known for their effective industrial designs. They incorporate this look and feel into the headset rather nicely. At first glance, it would almost seem that they forgot the controls completely, but there appears to be more beneath the surface. Sliding the thin silver headset cover reveals all the controls you need. The cover’s sliding motion was smooth and effortless. I tried, but I couldn’t see the sliding mechanism on the headset. I hope that this wouldn’t become too loose over time. There was a barely audible ‘click’ when it reached either destination, so if it did decide to come loose, it would still stay in place. The controls were as modest as the headset, hiding behind the headset cover. The typical multi-function button and volume controls were found at the end of the WEP 420. The indicator light(s) found at the top and bottom of the headset, just being the cover. I liked this idea, as to not blind the public with a blinking blue light aimed directly at them. The light will flash every 8 seconds when on a call, every 3 seconds in standby mode and will blink red when there’s less than 10% battery life left. The multi function button allows for answering, rejecting, voice dialing, redialing, call waiting and holding a call. The headset cover could also be considered a multi-function button in its own right. You can answer a call by sliding the cover open and end the call by sliding it closed. This is quite handy when driving, as it’s easier to slide than to try and find a small button. The cover also reduces the static and background noise heard during calls. To pair the headset, in off mode, press and hold the Multi-function button for about 8 seconds, the indicator light will sustain a blue light instead of blinking. Then follow the typical pairing steps and you are done. The WEP 420 utilizes the Quick Pair technology, so if your BlackBerry has Bluetooth enabled and you turn on the headset again, it will attempt to pair with your device. Again a driver’s must! Stepping out, with my Samsung! I drive under a variety of conditions on my way to and from work everyday; highway, city, construction even a ferry! Yes, a ferry everyday. So typically I put a headset through the paces fairly thoroughly. The WEP 420 worked admirably while driving in the city and on the highway. The background noise was minimal. While on a call to a local radio station, the on air personality commented on how clear it was. While on the ferry, I could still be heard relatively well over the engines though I had a hard time making out what was being said, making for a couple of wrong grocery lists. ( To this day I SWEAR she said buy a lot of ice cream). Very lightweight and easy to wear, this was more comfortable than previously reviewed headsets. So not only does it look good, it feels good too! At work, I would charge it on my desk, drawing the attention of passer-bys. A few hands had be slapped for not leaving it alone (with the exception of my boss). Now I’m told I may have to order some of these for our company. Many have said that the focus of this project between Samsung and Bang & Olufsen was on the cradle, not the headset. 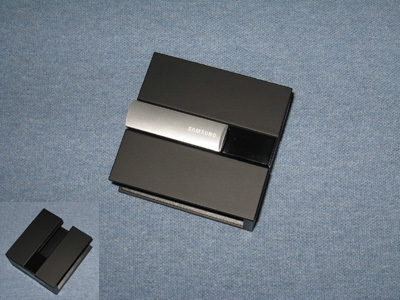 I would have preferred a smaller cradle, or at least if it had to be that big, some how include a speaker, having it interface, allowing for music to be played from your BlackBerry with the headset connecting the two. Though the cradle is bulky and a tad over zealous, I am glad to say the headset saved the day and passed the grade. It had a better talk time than the previously reviewed WEP 500 and the call quality was almost as good, I didn’t notice the volume increase or decrease to adapt to the background noise. I still say it’s a great buy at $89.95 at the CrackBerry store. Buy enough and you can use the cradles as building blocks.